In this paper, a model for aerodynamic behaviour of particulates (pollutants) that diffuses into the airway in the human lower respiratory track (LRT) containing mixture of pollutants, water droplets and mucus is considered. 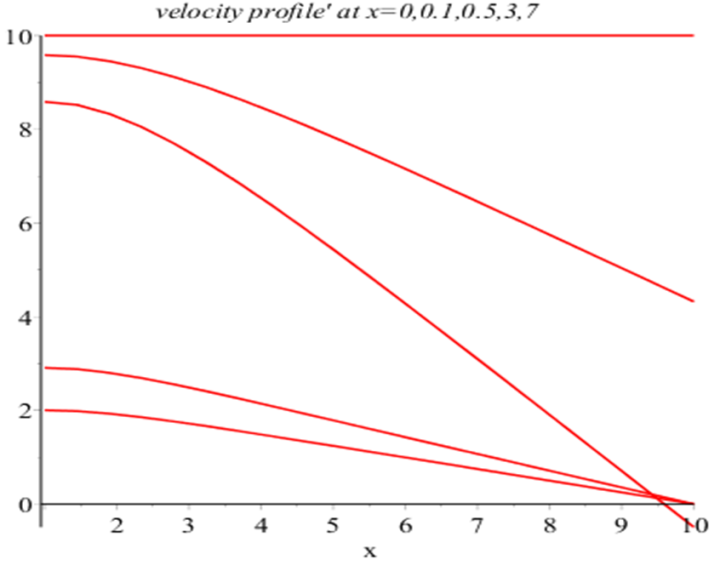 The velocity of the airflow is computed using the Nervier Stokes equation with fractal morphologic boundaries and the population of bacteria in the mixture studied using the Lauffeger-Aris-Keller model. 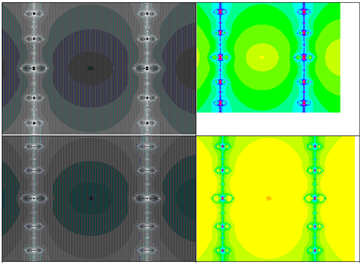 The series solutions to the models are obtained using eigenvalue and eigenfunction techniques. The concentration of the pollutants in the LRT and the airflow velocity profile are obtained. It is found that as the thickness of the irreversible structures formed on the walls of LRT increases then the airflow into the airway decreases. The population of bacteria is found to be stable if the if sustenance function is very small compared to the death rate of the bacteria. 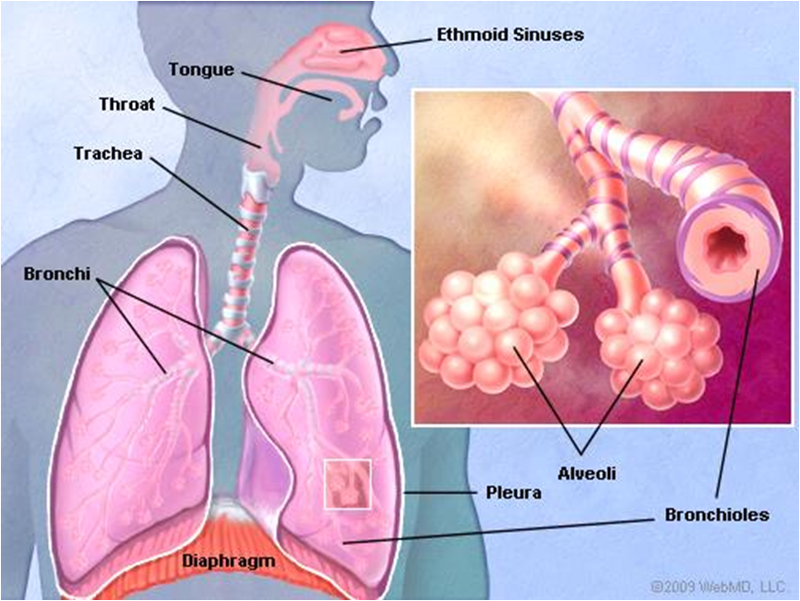 Therefore, for good throughput of airflow, the muscles of the walls of breathing ducts need to be dilated with drugs or through surgery by constructing Nano pipes to allow passages of air into the air sacs by bypassing the pulmonary obstacles to enhance free flow of air into the lungs. Oyediran, Oyelami Benjamin. "Models for Computing Effect of Pollutants on the Lower Respiratory Tract." American Journal of Modeling and Optimization 4.2 (2016): 40-50. Oyediran, O. B. (2016). 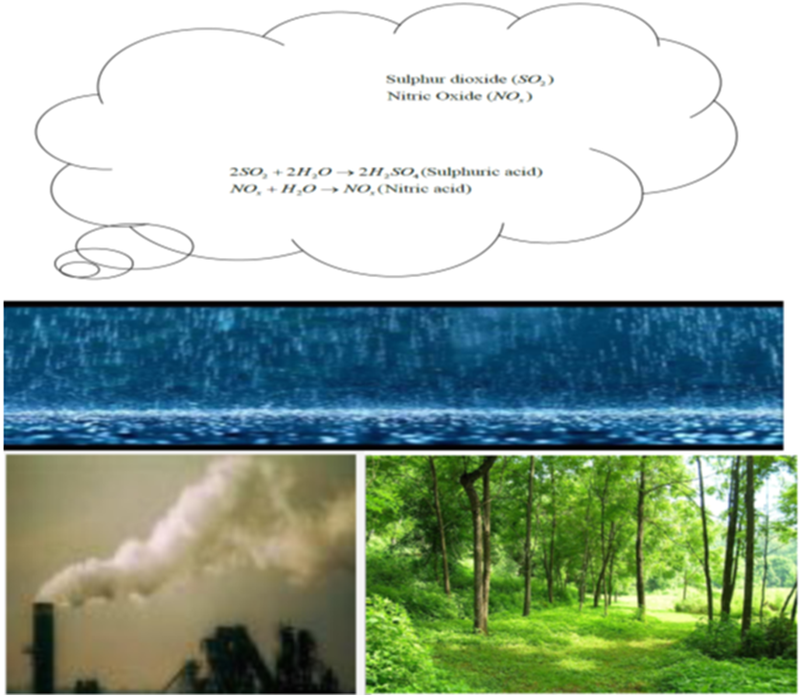 Models for Computing Effect of Pollutants on the Lower Respiratory Tract. American Journal of Modeling and Optimization, 4(2), 40-50. Oyediran, Oyelami Benjamin. "Models for Computing Effect of Pollutants on the Lower Respiratory Tract." American Journal of Modeling and Optimization 4, no. 2 (2016): 40-50. The dirty air we inhale contains dangerous pollutants such as ozone (O3), dust, pollen grains, smoke, carbon monoxide (CO), sulphur dioxide (SO2) and nitrogen oxides ( ) and heavy metals etc. These pollutants are dangerous to health ([2, 5, 6, 7, 12]). Ozone is formed when volatile organic compound reacts with nitric oxide with sunlight as catalyst. Air pollution can lead to damage of the respiratory tracts that can trigger up asthma, lung cancer and chronic obstructive pulmonary diseases (COPD) (). Microbes in the lower respiratory track (LRT) can lead to chronic bronchitis also. COPD is characterised by irreversible narrowing of the airway. Moreover, COPD is caused by exposure to pollutants in the air that produce inflammation and morphologic disorder. Pollutants often disturb air passages in the respiratory tracks, which may lead to destruction of tissues in the body or emphysema as it called in Medicine ([7, 15]).Allergenic substance from ruptured pollen grains can trigger allergic airway diseases (AAD) such as asthma, sinusitis and allergic rhinitis. There were several scientific evidences that suggest that sensitization to pollen allergens can be enhance with co-stressors such as gasses and or particle-phase of air pollutants, including nitrogen dioxides, ozone and diesel exhaust particle ([4, 10, 17, 19]). In the recent times, medical researchers have established that mothers exposed to a class of pollutants called Polycyclic Aromatic Hydrocarbons (PAH) during pregnancy are found to give birth to children with behavioural problems and low intelligence quotient (IQ) at school age. The odd behaviours are associated with Attention Deficit Hyperactivity Disorder (ADHD).PAH are released to air during incomplete combustion of fossil fuel such as gasoline, coal, diesel and other organic materials([5, 12]). The relationship between air pollution and infection have been reviewed (see ) and how both could act synergistically to cause respiratory illnesses especially in exacerbating symptoms in patients with asthma and chronic obstructive pulmonary disease. There are several research works in the literature on modelling of respiratory systems see for examples ([7, 14]). Ted et al. () developed computer simulation of airflow and particulate-transported within human respiratory systems as applied to aerosol therapy. Fredericket. al. () modelled ozone (O3) dosimeter that takes into account convection and diffusion into the lumen and chemical reaction in the mucus, surfactant layer, the underlying tissues and capillaries. The model applied to human airways morphometric data. The results found to be most sensitive to uncertainty in the knowledge of transport parameters, tissues and blood compartment thickness and chemical reaction rate. made quantitative analysis of the airflow in the trachea and main bronchi through computational fluid dynamics (CFD) simulation. Recently, the development of imaging techniques Multi-detector Computed Tomography (MDCT) scanners with increasing numbers of detectors are allowing the acquisition of isotropic volume data that can be displayed in any selected 2-dimensional plane with the use of 2-dimensional multiplanar reformations. Magnetic resonance image (MRI) is being used to evaluate morphologic difference between malignant and benign pulmonary nodules through dynamic studies. Thin film growth by molecular beam epitaxial (MBE) is a modern technology of growing single crystal that inherits atomic structure from substrates. Modelling of epitaxial growth is a challenging multiscale problem. 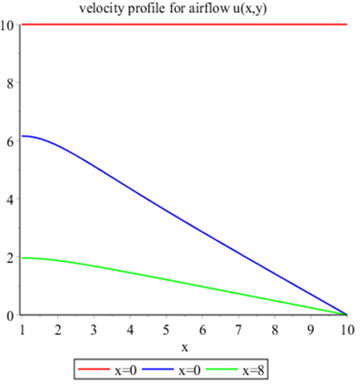 Modelling and simulation of film growth has taken various approaches, from molecular dynamics and Kinetic Monte Carlo Computational Simulation (KMCS) to continuous equation of height as the only dependant variable ([1, 8, 11, 13]). In this paper, we intend to model aerodynamic behaviour of particulate (pollutants) that is measure the diffusion and sedimentation of pollutants into the airways. It is hope that the models will give us insight to understand the physiology and pathology of the airflow when pollutants enter into the human lower respiratory tracts (LRT). Furthermore, we will study the flow of air into human lower respiratory tract containing pollutants, bacteria, water droplets and mucus. 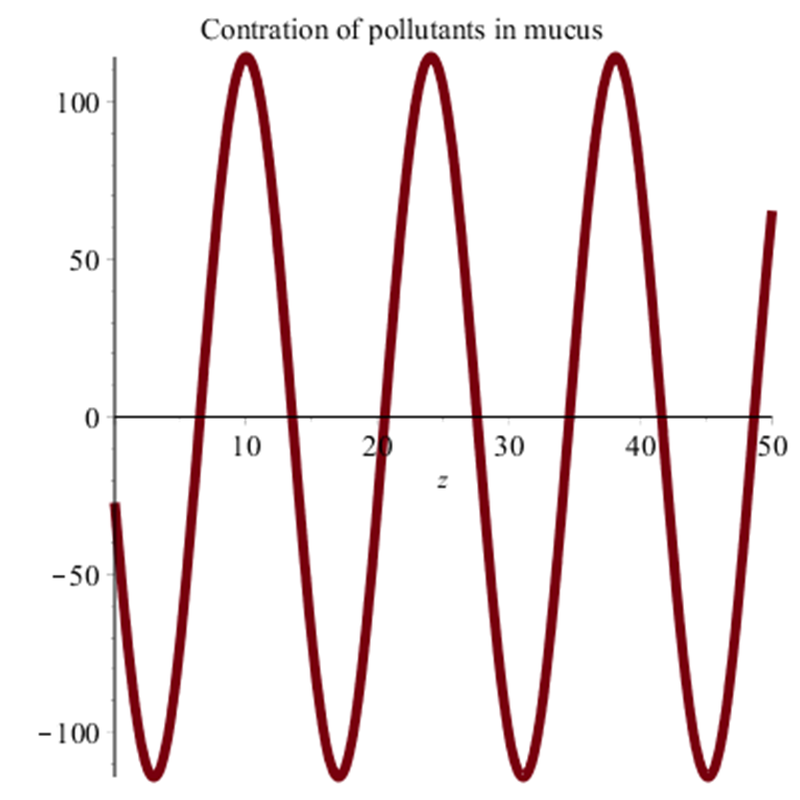 The pollutants dissolves in the mucus which later leads to thickening of the walls of respiratory tracts. The pollutants are assumed to be distributed uniformly in the mucus when the air flows into the breathing tracts .The mixture of pollutants and mucus form irreversible structures which thickens the walls of the organs in the LRT. The irreversible structures formed in the breathing ducts can take different shapes and sizes and could affect the volume of air in lung available for breathing during respiration and air expired after expiration. Since there is no general pattern for formation of irreversible structures on the walls of breathing tracks we assume that the structures take the shape of fractals which we make use of to model the morphology. We will study the aerodynamics of airflow using the Nervier Stokes equation and the Lauffeger-Aris-Keller model and fractal morphologic boundaries. Carbon dioxide (0.03%) and other ones in negligible forms are: Neon, Helium, Methane (CH4), Krypton, Hydrogen, and Xenon together with traces of water vapours. Methane is 2 out of 1,000,000 atoms/molecules of air. Bacteria are a big source of methane gas. Methane comes from petroleum fields also and is the natural gas for cooking. Throughout this paper particulates will mean the solid particles suspended in the air. The brownness of cloud in cities is from a mixture of dust, smoke, other particulates, and nitrogen dioxide (which is brown). Perhaps, the most dangerous component of wood smoke is the countless airborne particulates. Particulates that are smaller than 2.5 micronsare harmful because they are tiny enough to be lodged inside lung tissues, while particles larger than 2.5 microns can be coughed out. Researchers have discovered that the particulates found in wood smoke are smaller than 2.5 microns. From the foregoing, particulates from mould, smoke, dust mite debris, household dust, virus and bacteria are dangerous to human health. Furthermore, from toxicology point of view particulates smaller than 10 microns have potential of being active biologically in susceptible individuals (). Particles that are smaller than 0.1 microns in diameter are deposited by diffusion; while particulates on 0.1-1 micron range are deposited on the respiratory tracks by gravitational and diffusion transportation. 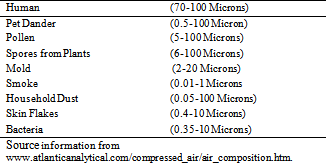 See Table1 and Figure 1 for common sources of air pollutions. Pollen: Pollen is one of the common particulates in the air. It is one of the biggest triggers of allergic reactions. Car engines produce nitrogen oxides ( ). Incomplete combustion of gasoline supplies much of the volatile organic compounds. These combined with the energy from the sun to produce unhealthy levels of ozone. Under high temperatures like in a jet engine or car engine, nitrogen will combine with oxygen to form a class of nitrogen nitrites. Nitrogen oxides and sulphur dioxide with water give rise to acid rain which is dangerous to human health and biodiversity (Figure 2). Anatomical features of the human respiratory systems include trachea, bronchi, bronchioles, lungs, and diaphragm and molecules of oxygen and carbon dioxide see Figure 4. 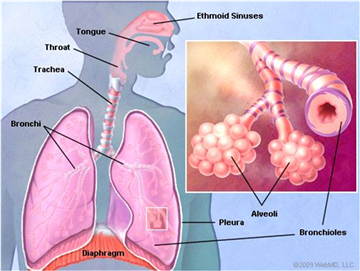 Human respiratory system is made of lower respiratory system (LRS) and the upper respiratory system (URS). Upper respiratory system is made of the nasal cavity (nose chamber i.e. ethamoid sinuses), pharynx and larynx. Lower respiratory system is made of the trachea, primary bronchi and the pair of lungs (See Figure 4). The bronchus (from Greek bronkhos "windpipe") is the part of the respiratory system that connects the trachea to the lung parenchyma. It is composed of an extensive branching of airway passages that transmit the air from the atmosphere to the alveoli (the gas-exchange units). By definition, bronchi are airways with cartilaginous walls. The size of cartilage in the walls of bronchi decreases progressively and disappears eventually by the time the bronchi divide into airways of about 1 mm diameter. The smaller airways that lack cartilage are called bronchioles. The pulmonary tree connecting the atmosphere with alveoli which are small sacks (See Figure 4) are air filled sacks from alveoli oxygen diffuses across a membrane into the blood of the pulmonary capillaries and the expelled air contains 10 per cent of oxygen. In this paper our interest is LRS therefore our discussion will only centers on this. We shall consider: airflow dynamics, formulation of irreversible structures in the airways because of chemical reaction between pollutants and mucus containing bacteria. 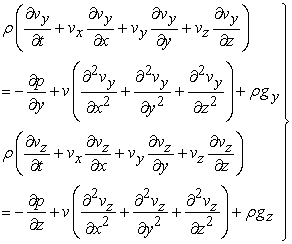 We will make use of the Nervier Stokes equation and Lauffege-Arial-Keller (LAK) model to obtain results. is the spatial divergence of the vector field ; if air density is observed to be constant then in which implies that the flow is incompressible. We shall assume that the air density is constant. 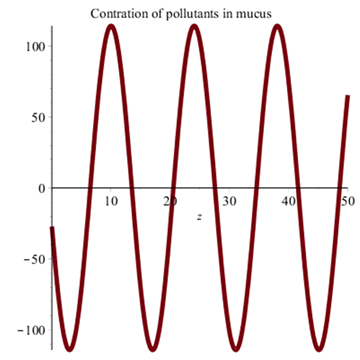 In the mucus film, the pollutants undergo chemical reaction. We assume that the air bubble is surrounded by stagnate liquid film (Mucus) of thickness size which is small relative to the bubble diameter, the pollutant is soluble sparingly in the mucus and hence the convection term is negligible. 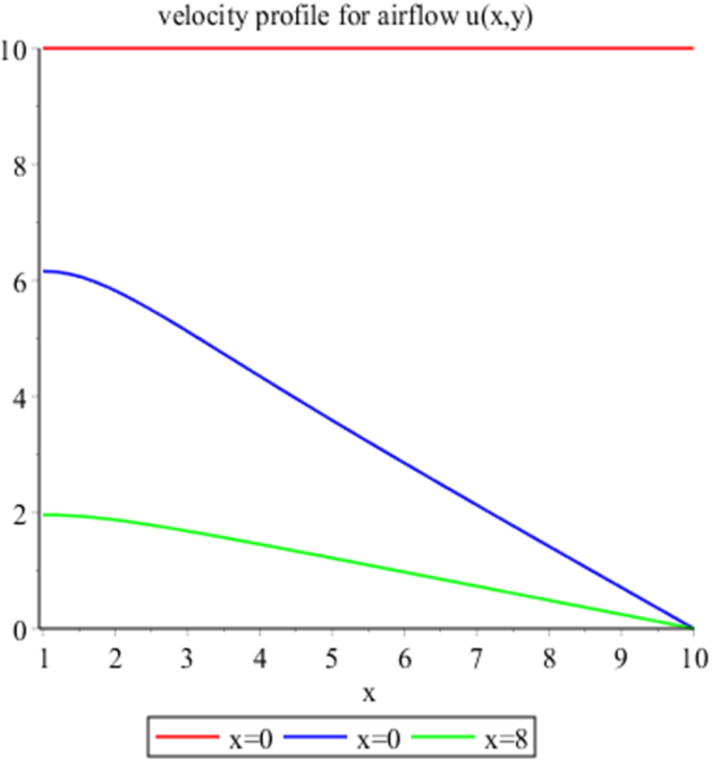 The phenomenological derivation of population of bacteria we will consider is based on fundamental conservation equation for the population density of bacteria at time and at distance from the source .The phenomelogical equation is given as where is the flux into volume element and is the net birth rate such that .If there is chemotaxis effect, . is chemotaxis sensitivity to an external given gradient and is mobility constant. Consider the growth of bacteria in the trachea which is contained in the mixture of pollutants and mucus of concentration at time and at distance from the source. Irreversible structures are formed and if the structures are building up in an uncontrollable way, the case of cancer is experienced. We make use of Cartesian coordinate system with pointing downstream and perpendicular to part of lower respiratory tract and perpendicular to . Where are velocity component of air in the direction of respectively. is the pressure and is the constant air density. 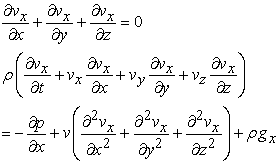 are accelerations due to gravity in the direction of respectively. We assume that is negligible and .Let be the average thickness of the solid formed by mixture of particulate and mucus. is the velocity of the airflow and is the pressure of the air in the air space at time t and is the viscosity which takes a fractal structural form and it is formed on the breathing tract and obstructs the free flow of air to the tract. To generate an animation for the Julian fractal for and range . 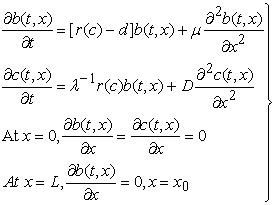 The parameter can be adjusted in such that . The Julian fractal gives pictorial relation of the formation of the irreversible structure at the edge of the trachea as can be seen in the Figure 10. Satisfying given boundary conditions and is the fractal function responsible for resistance of airflow in the lower respiratory track. We can choose the resistance on the boundary also by imposing boundary conditions using fractal functions. 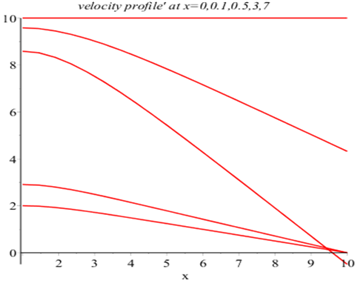 Using the viscosity function , and the Maple 2015 code (See Appendix) the velocity profile for airflow are obtained (See Figure 13 and Figure 14). From the Figure 13 and the Figure 14 the velocity of airflow decreases as air moves down the breathing tracts. By comparison principle the series in the equation (15) is convergent and to avoid singularity in velocity profile assume that . Moreover, therefore, velocity profile increases with and decreases with which implies that as the thickness of the irreversible structures increase then the airflow into the airway decreases. Therefore, for good throughput of airflow, the muscles of the walls of breathing ducts need to be dilated with drugs to allow free flow of air into the breathing pipe. Imposing the boundary conditions we get hence . We have the situation, wherein, the cells depreciated with time, hence, we choose instead of . Formation of irreversible structures on the boundaries of the human LRT makes inflow of air to be obstructed. The influx of air can be enhanced by dilating the muscles of the walls of the LRT and removing the structures by surgical means. In future research and surgery, the use of aerosol therapy need to be further explored or construction of Nano pipes to allow passage of air into the air sacs by bypassing the pulmonary obstacles to enhance free flow of air into the lungs. It is worthy to note that the use of geometric models will help us to understand the anatomy and physiology of the breathing track whenever thick structures are formed on them. The use of fractals or epitaxial growth model and imageries of technology of the structures will help us to understand the anatomy of LRT when pollutants are inhaled for long period of time and which possible ways we can enhance airflow into the LRT. The authors hereby acknowledge the support from the National Mathematical Centre, Abuja, Nigeria and the research grant received from the ISESCO-COMSATS Cooperation for Supporting Joint Research Projects in Common Member States (2014-15). Andreas Ratz, Axel Voigt, Edge diffusion in phase-field models for epitaxial growth. Multiscale modelling in epitaxial growth Vol.149, of Series ISNM International Series of Numerical Mathematics pp115-125, 2005. Anoop J Chauhan and Sebastian L Johnston. 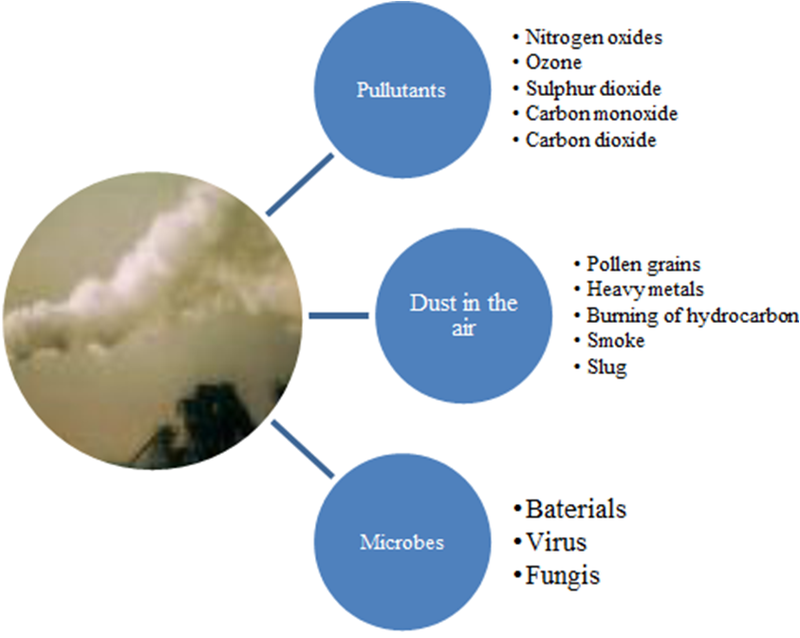 Air pollution and infection in respiratory illness. British Medical Bulletin (2003) 68 (1): 95-112. Barrett KE, Barman SM, Boitano S, et al. Pulmonary function. Ganong's Review of Medical Physiology. 23E. New York: McGraw-Hill; 2009. Chapter 35. D’Amato G Cecchi, Bonini L., Numes S, Annesi C., Maesano, Behrendt I., Liccandi H., Popov G., and Van Cauwenber P. Allergic Pollen and Pollen allergy in Europe, Allergy 62, 976-990, 2007. Frederica P. Perera, Shuang Wang, Virginia Rauh, Hui Zhou, Laura Stigter, David Camann, Wieslaw Jedrychowski, Elzbieta Mroz, and Renata Majewska. PrenatalExposure to Air Pollution, Maternal Psychological Distress, and Child Behavior. Pediatrics, October 2013. Jay B Brodsky, Alex Macario and James B.D.Mark, M Tracheal Diameter Predicts Double-Lumen Tube Sizea Method for selecting left Double-LumenTubes .Anesth. Analog 1996, 82; 861-864. Joachim Heyder, Deposition of inhaled Particles in the Human Respiratory Track and Consequences for Regional Targeting in Respiratory Drug Delivery. Proceedings American Thoracic Society, Vol.1, Nineteenth Transatlantic Airways Conference (2004), and pp.315-320. Markov I V,Crystal growth for Beginners: Fundamentals of Nucleation, Chrystal growth and Epitary. World scientific, 1995. Mridul K. Thomas, Colin T. Kremer, Christopher A. Klausmeier, and Elena Litchman. A Global Pattern of Thermal Adaptation in Marine Phytoplankton. Science, 2012. Nathan R. Meltzer E., Selner J. and Storms W. Prevalence of allergenic-rhinitis in the United State. J. 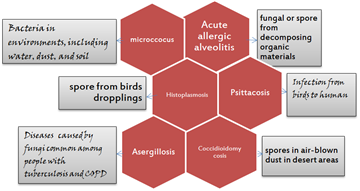 Allergy clin.Imm, 99, 808-814, 1997. Pimpernel A. Villian J, Physics of crystal growth Cambridge University press 1988. Oyelami Benjamin Oyelami, Buba M. Wufem Models for computing emission of carbon dioxide from liquid fuel in Nigeria. American Statistical Review (To appear). Schulze, Weinan E.T.P, Journal of Chrystal growth 222 (2001), 414-425. Shouliang Qi, Zhengzhou Li, Yong Yue, Han JW van Triest, and Yan Kang Computational fluid dynamics simulation of airflow in the trachea and main bronchi for the subjects with left pulmonary artery sling.Biomed Eng. Online. 2014; 13: 85. Published online 2014 Jun 24. Ted B. Martonen,Zongqin Zhang, Genqian Yu, Cynthia J. Musante. Three dimensional Computer modelling of the human upper respiratory tract.Cell Biochemistry and Biophysics.Vol.35, (3), 2001, pp255-261. Byron Bird Warren E Stewart, Edwin N. Lightfoot, Transport Phenomena. Second edition Wiley International Press.2012, Singapore. Byun D. and Schere K. Review of the governing equation, computational algorithms, and other components of the models-3 community multiscale air quality (CMAQ) modelling system, Appl.Mech Rev. 59,51-57, 2006. Laufenberg D., Airs R., and Keller K. H. Effects of random mobility on growth of bacteria population. Microb Ecol.7, 207-227. Zhang K., Duhl T., Salam M.T., House J.M., Flagan R.C., Avol F. D., Gilliland, Guenther A., Chung S.H., Lamb B. K. and VanRekan T.M. 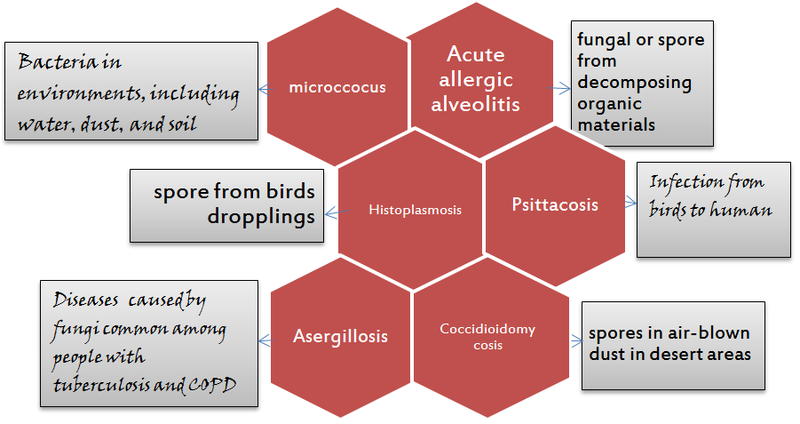 Development of a regional –scale pollen emission and transport modelling framework for investigating the impact of climate change on allergic airway disease .Biogescience 11, 1461-1478, 2014.